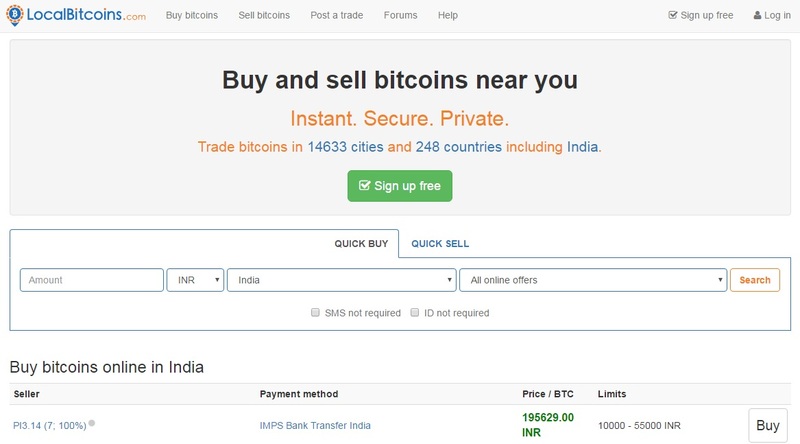 Localbitcoins.com is an online platform or site designed for the trading (buying or selling) of crypto-currencies like bitcoins. In this exclusive site, bitcoin trading is done via person to person (P2P trading) and the bitcoins are usually stored in the online wallet available in the site. This bitcoin exchange platform uses peer to peer mechanism for all the transactions. When an user delivers a reply in five minutes to his trading partner, a green dot appears on the platform. Likewise if the reply is within 30 minutes, then an yellow dot appears on the platform. A grey dot appears in case of getting a reply after 30 minutes. This platform lets the users of various countries to exchange or convert their respective currency types into bitcoins. It supports a variety of payment options (approximately around 60 payment methods) all over the world including National bank transfer, transfer with specific bank, PayPal and so on. All the bitcoin services offered by this platform are highly compatible, but irreversible. Various advertisements regarding the payment options and the exchange or conversion rates associated with bitcoin trading are also displayed in this platform. The users can make use of those advertisements displayed over the site for their bitcoin trading, which can done through online banking or person-person. Click here to visit LocalBitCoin Website. It offers a specific default protection mechanism called escrow for all the online trades done over this platform, which automatically protects the users from scams. The users can split each bitcoin into various smaller portions, each of which is named as one satoshi (equal to 0.00000001 BTC). 0.0002 BTC is the minimum limit for sending or transferring bitcoins to the wallet of localbitcoins.com. In this platform, Bitcoin transactions are usually done within a time limit of 10 to 60 minutes. The major objective of this platform is to link each and every city with bitcoin exchanges, thereby improving the world’s economy. Bitcoin is an essential key for several countries (mainly for developing countries like India), through which they flourish themselves and enhance their economic value. Localbitcoins.com is a bitcoin trading site or online marketplace based out of Finland. It was launched in 2012 with Nikolaus Kangas as its CEO (Chief Executive Officer). It is a decentralized platform for the trading of bitcoins. It does not facilitate corporate overhead. It ensures a fast, instant and simple trading process in comparison with the other bitcoin trading platforms, since the trading is between person to person. The payment option supported by localbitcoins.com is best suited for its user community. It offers strong safety and protection to those users, who purchase bitcoins across this platform. Bitcoin trading is usually done within a few minutes, which means that the time taken for trading is very less. Instant online transactions can be done easily with bitcoins instead of using traditional banking. It is a risk – free and easily usable platform. It contains a professional and dedicated team of support. The users are given the authority to display advertisements in order to trade their bitcoins. These types of trades usually deal with face to face (person to person). It does not enable escrow protection automatically, thereby offering insecurity to the users. These types of trades usually deal with online trading methodology and it does not involve face to face meeting or discussion. It enables the escrow protection automatically, thereby offering strong security to the users. It does not impose any charges or fees for the trading of bitcoins. Instead, it offers free registration and trading facilities. But only a service charge of 0.5% is being deducted from the users’ account upon each and every transaction done on this platform. Hope this Localbitcoins review will be helpful for you. Please share your suggestion or feedback in the comment section below.